Bad weather conditions might further delay racing the prototype on the test track. 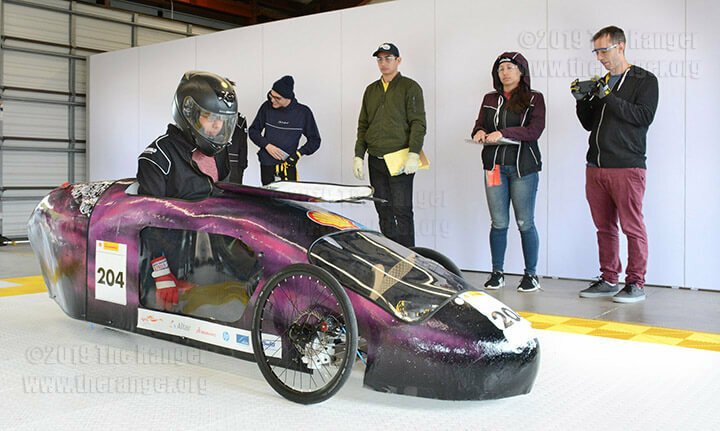 SONOMA, Calif. — The Motorsport team is waterproofing their vehicle for a test run in the rain after their vehicle passed the technical inspections April 4 at the Shell Eco-marathon Americas competition. Inspections consist of checking the vehicle’s design and safety. Tests included weighing the vehicle and drivers, testing the brakes, measuring the vehicle’s dimensions, checking the vehicle’s mechanical and electrical design, testing safety belts, driver visibility and the hydrogen tank. The team had to modify the shell of the car to prevent spindles connecting the wheels to the frame from catching, add a seal to the firewall between the driver and the motor, patch up hydrogen gas leaks, and reposition hydrogen leak holes in the shell to allow any escaped gas to pass a detector. To be allowed to test run a vehicle on the test track, the vehicle must pass all inspections and be approved by Shell officials. The team initially tried to have the vehicle inspected April 3, but they narrowly missed the inspection window after a problem with the brakes. The team completely altered the brake pedal system to make it more stable. If a team doesn’t pass an inspection, they must go back to the paddocks and fix the issue, then return to the station and have it re-inspected. 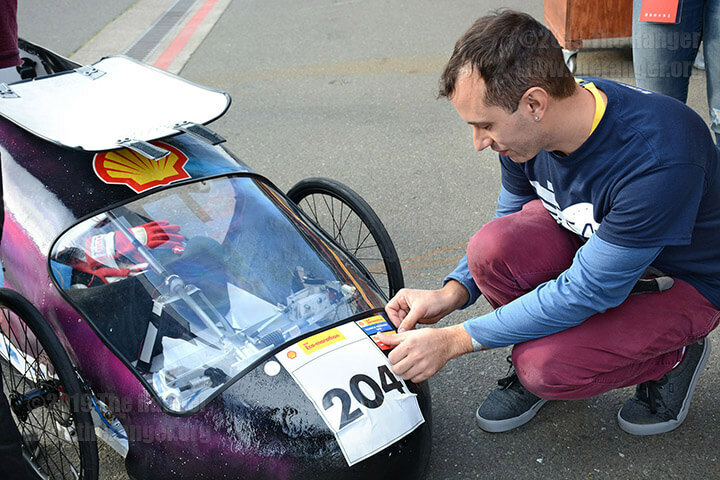 Minutes after passing the last re-inspection of the hydrogen tank, the team applied two stickers to the front of the vehicle at 6 p.m. Pacific Standard Time to show officials their vehicle is inspector approved. Inspections continue until noon today for those who haven’t passed. Moore said she wanted to get Odyssey on the track by the end of the day. The test track closed at 6:30 p.m. PST Thursday and the team narrowly missed the window again as they assembled the vehicle. This means the team will attempt test runs today, although rain has created delays that are still in effect. Officials announced the test track will open at 1:30 p.m. PST, weather permitting, starting with prototype vehicles. Teams who registered in advance will have priority. 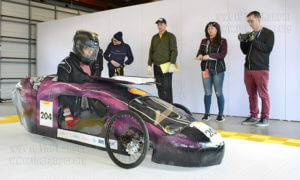 The Motorsport team was working on Odyssey during sign up and will get in line at 1 p.m. PST to test run their vehicle. If the team can’t do a test run today, Moore said they’ll have to wait until tomorrow, which is also the last day to do competition runs. 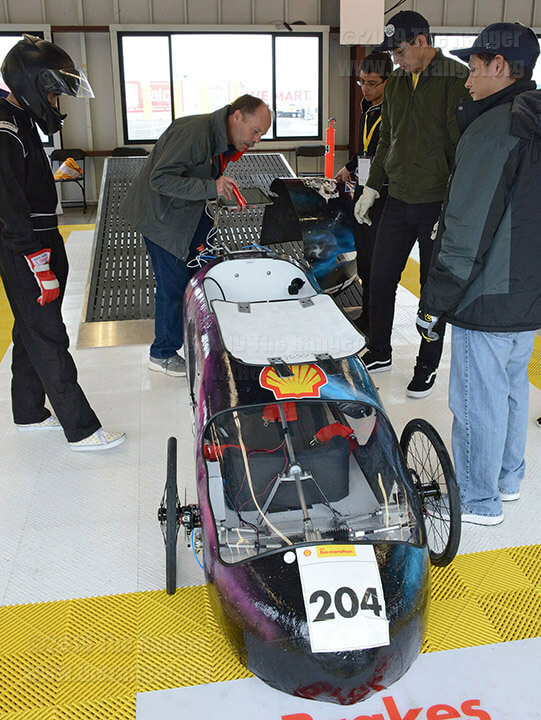 Odyssey, the team’s hydrogen fuel cell prototype vehicle, will compete against five other vehicles in the same category from Duke University, Warren Tech Central, Wheat Ridge High School, Darien High School and the University of Alberta. Other classes competing at the raceway are urbanconcept and autonomous urbanconcept. The other categories competing under these classes are battery, electric and internal combustion, which includes gasoline, diesel or ethanol. Prototype competition runs take place today and April 6. Moore said each team usually gets five runs, but if the weather is bad they can lower that number. The Ranger will continue coverage of the competition throughout the weekend.